I want to farm the Three Sisters which are beans and squash and corn. You put stuff in the ground and it grows here! In Albuquerque you put stuff in the ground and you have to watch it like a hawk and water it all the time…I’m not used to water falling out of the sky. In true, New Mexican fashion, Courtney plans to plant a variety of chili peppers—sandia hots and some big jim green chili—just enough to freeze along with the pumpkins she plans to plant. A knowledgeable canner, she also plans on making and canning spicy beans for future use. 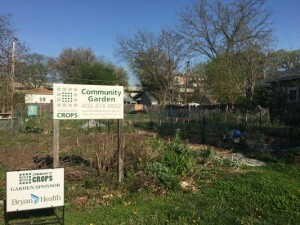 Courtney is excited about the diverse community within her garden. 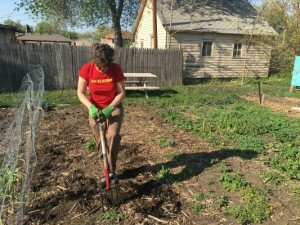 Familiar with the traditional foodways of the Native American communities in Albuquerque who “grow corn and squash and beans and chilis,” she likes the idea of coming out to the garden and seeing an unfamiliar plant. Now she will be able to grow the comfort foods of her childhood, just like her gardening neighbors!